The salary disparity between women and men is real. Here’s what every company should do about it. How should business owners be thinking about equal pay in 2019, and what actions should we be taking? I recently attended a conference of CEOs where we spent multiple sessions talking about the best practices for closing the gap. Both female and male leaders shared their strategies and learnings of how to set up equitable hiring practices and how to drive to parity after a team had been built. While the tech industry certainly still has a way to go overall, we should look to the best organizations and practices as a guide for how we can more quickly close the gap. First, let's take a look at a snapshot of some current data about the gender pay gap. 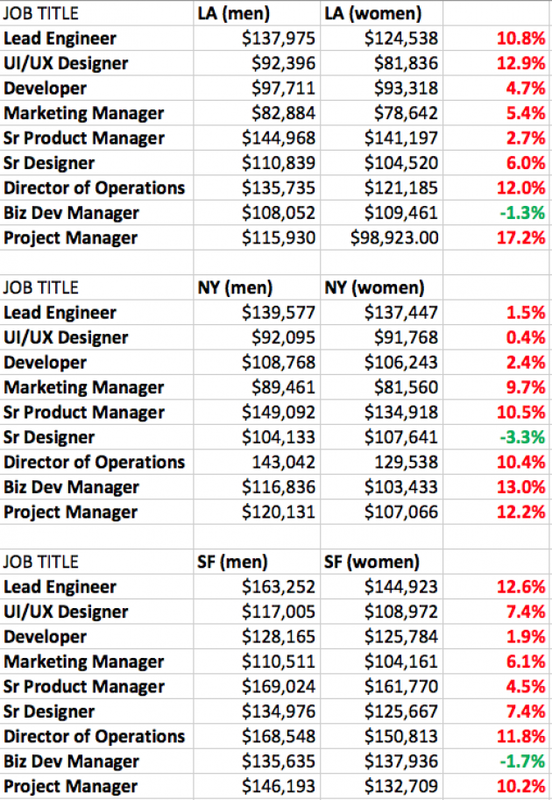 Here is a sample of nice popular corporate and tech roles based in Los Angeles, New York, and San Francisco, and how the pay disparity still manifests today. The salary data represents the median salary for these roles, and the data comes directly from tens of thousands of user-contributed salaries on Comparably.com. Less than half of women feel they are paid fairly. Many people feel underpaid, especially women. Just 44 percent of women say they feel they are paid fairly. Fifty-one percent of men say the same. Women are less likely to negotiate their salary. When asked if they negotiated their current salary, 44 percent of women and 53 percent of men said yes. The confidence gap is real. When asked whether they'd feel comfortable asking their boss for a raise, 54 percent of women said yes compared to 60 percent of men. In light of this, what actions should business owners be taking to close the gap? Here are a set of best practices that are becoming commonplace at tech companies. 1. Publish salary ranges up front. Be upfront about your compensation in your recruiting process and job posts. Candidates are seeking more transparency about organizations and their compensation structure. By showcasing your salary ranges for job titles up front, it helps eliminate the inequality of salaries in the hiring process. 2. Pay parity for the same job titles. Define a set salary structure for a job title; all candidates get paid the same amount for that title/role. This takes the ambiguity out of widely disparate compensation ranges for the same job. As a business grows in employee count, and more varied job titles, it becomes more feasible to tie a specific compensation structure to a job title. 3. No negotiation policies in offer letters. This both eliminates the ability for more skilled negotiators to earn more than their peers, and necessitates that employers put forward their most compelling offer up front to a candidate. Pay disparity often starts at the salary negotiation level, which has historically negatively affected women. 4. Stop asking about salary histories. A candidate's compensation should not be pegged to their previous role, but rather to the value they will add to your business. In 2018 Starbucks announced it reached 100 percent pay equality for women, men, and underrepresented monitories, ending a 10-year process to correct pay difference among its employees. It attributed its success in large part to its new hiring practice of not asking for previous pay history. 5. Invest in pay parity. Be willing to invest company resources to examine and correct pay disparity. Salesforce, Intel, and Apple, for example, have all signed the Equal Pay Pledge. The initiative required companies to review their hiring practices, create policies to ensure equal pay, and conduct an annual analysis on the gender wage gap. Salesforce notably announced a $3 million initiative to close its gender pay gap after analyzing its payroll. Intel released a diversity and inclusion report that showed that the company has reached 100 percent gender and racial pay equity in the U.S. Apple announced that it had finally closed its gender pay gap and that all male and female employees in the U.S. are being compensated equally. Progress continues to be made in closing the gender pay gap, and pay disparity does tend to shrink the longer employees stay in their roles. But there's more still to be done. Equal Pay Day, April 2, represents the date into 2019 that women had to work to earn as much money as men earned just in 2018. We should all look forward to a time when we read articles about equal pay on January 1.